Anyone who knows me personally knows that I'm a night owl with terrible sleep habits. I wish I could blame it all on the kids, but I've always been this way. I've always been that person who gets by on very little sleep each night - and lots of coffee in the morning! Four hours sleep is pretty standard for me most nights. Five hours is amazing! As I'm a night owl, I find that I'm much more productive at night so that's when I get all of my blogging, party prep, crafting and photo editing work done. It's also when I do most of my bad TV watching and catching up on internet gossip! Shh.. you didn't hear that last bit. I rarely make it to bed before 1am, and thanks to Mathilde's habit of waking at 3am to nurse, my night of sleep is always broken. Ok, so I can partly blame my sleep habits on one of the kids! Let's just ignore the fact that she's two and I really need to put a stop to her middle of the night feeds. ...School goes back in just over a week! Eek! How did that happen? Where did the Summer go? With early morning starts on the horizon again, I really need to do something about my sleep habits so I can be at my best in the morning. There's only so much coffee can fix! So, rather than trying to make up for my lack of sleep when I wake up in the morning, I need to take steps to prevent it in the first place. 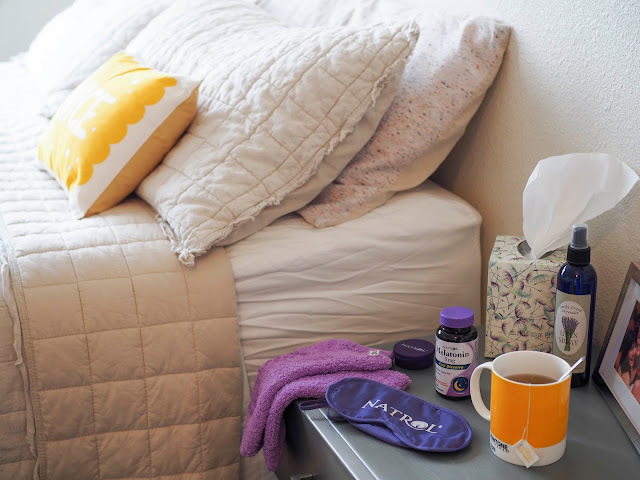 Easier said than done, I know, but I've come up with a list of safe and drug free tips that are proven to help create a restful body and mind to encourage a good night's sleep. I'm going to try my darnedest to stick to these and make them work. I'm really good at making sure that my girls drink plenty of water. All three of them need water bottle refills several times a day. Unfortunately I can't say the same for myself. It's a pretty common theme throughout motherhood, isn't it? I need to work harder on making sure that I'm keeping myself hydrated - and not just with coffee! When I'm well hydrated I feel so much better. I feel rested, I have more energy and concentration, my skin looks and feels better, and I don't feel as hungry, which helps with the next tip. This is one of my bad habits. Not only am I usually up late at night, but I'm often snacking at the same time. I'd love to say that I'm snacking on something healthy like grapes or nuts, and sometimes I am, but more often than not it's something very much not healthy like chips, chocolate or uncooked ramen noodles. Ok, that last one probably sounds horrible, but they're actually kind of tasty. They used to sell packs of dry noodles at my school canteen as a crunchy snack when I was a kid but no one seems to believe me! I'm going off track here. Enough of my weird snack choices. What I was trying to get at was that snacking at night is no good for sleep. Your body needs to rest and rebuild while you're sleeping, and if it's busy digesting chips, chocolate and dry noodles, it's not resting as effectively as it could be. I remember reading once that a lot of the time we confuse our body's thirst signals for hunger. So often when we feel like a snack, our body actually really just needs hydration. Salty snacks only make this worse. So skip the snacks after dinner and drink water instead if you feel hungry. More often than not the hunger pangs go away. When I remember to do this, I always feel much better. Of course, chips are pretty tasty so avoiding them requires will power. I'm fresh out of tips for that! Hey, I'm an adult. I don't need a bed time. I can go to sleep whenever I feel like it. Can't I? That's pretty much been my attitude for almost two decades - and it shows, because I'm always tired. Setting a regular bed time (and trying to stick to it) seems like such a simple step, but this one is actually going to be the hardest for me. Seeing as I get most of my work done at night after the kids have gone to bed, getting to bed early myself is kind of tricky. If I'm on a roll with writing or photo editing, I just don't want to stop. But I'm going to try and make myself stop because my sleep is more important - even if I wish it wasn't. With the big girls back at school I'm hoping I'll have more time to get blogging work done during school hours which will leave my evenings a little more free. I know that I'm not going to be able to suddenly start going to bed at 10pm (or if I'll ever be able to do that) but I'm going to try and make sure that I'm in bed by midnight. It will be a definite improvement for me. Coffee and tea are my go to drinks during the day and while they give me a boost, I actually find them both rather calming and relaxing. All that caffeine isn't good at night though, so even though I've been known to drink a cup of English Breakfast before bed, I'm going to try my best to avoid caffeinated drinks after dinner and start drinking chamomile tea before bed. 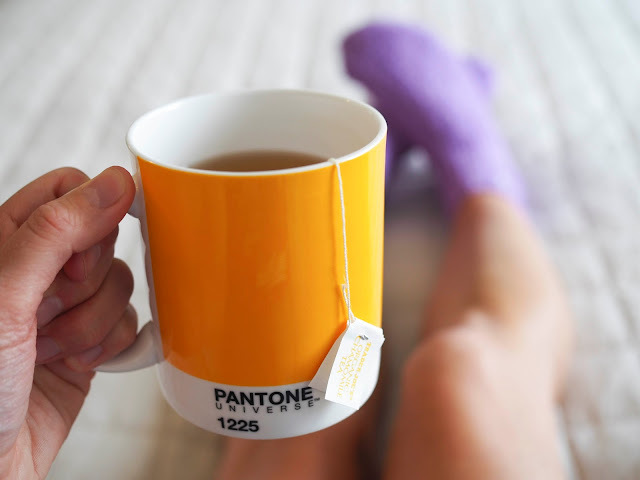 A cup of warm chamomile tea, with honey for sweetness, is great for helping your body and mind to relax. If chamomile isn't your thing, warm milk (with or without honey) can also helpful. Or even just hot water with honey and maybe a little lemon juice. Lavender oil has long been associated with relaxation and sleep. There are many ways that it can be used to help you unwind. Taking a warm bath with a few drops of lavender oil is an ideal way to relax before bed, but I'm more of a morning shower person. Plus, with a drought here in California I try not to take baths very often. I prefer to either use an oil diffuser in my bedroom (you can buy electric ones that are safer than the traditional candle lit ones), or, my favorite, I spray my pillow and sheets with lavender linen spray. The linen spray is gentle enough that it won't damage my sheets and the smell is subtle enough that it's not overpowering right next to my head. Plus it feels a little indulgent which is always nice. You can find lavender linen sprays in home ware stores, or you can make your own by mixing 1 tablespoon of isopropyl alcohol (or vodka) with 20 drops of lavender essential oil and enough distilled water to fill a 4 ounce spritzer bottle. Sometimes falling asleep, and staying asleep, can be tricky due to factors outside of our control such as noise and light. Our apartment building has a Trader Joe's supermarket at street level and our apartment is located above their loading dock. This usually isn't a problem unless their 5am delivery trucks happen to wake me up. Then it can be really hard to fall back to sleep as they're super noisy. I find that playing quiet music helps to distract me from the loud noises outside. Friends rave about white noise machines to block out city noises but I haven't personally tried one. Ear plugs come in handy as does a sleeping mask to block out extra light. Sometimes we all need a little extra help getting to sleep and staying asleep. 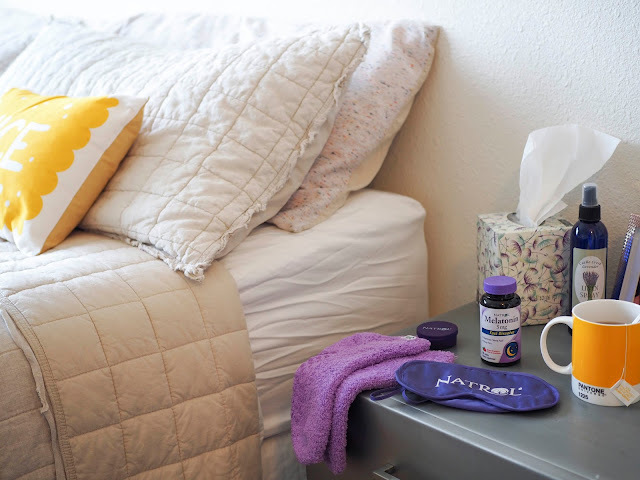 Natrol Melatonin is a 100% drug-free sleep aid that can help get that good night's sleep we're all after. 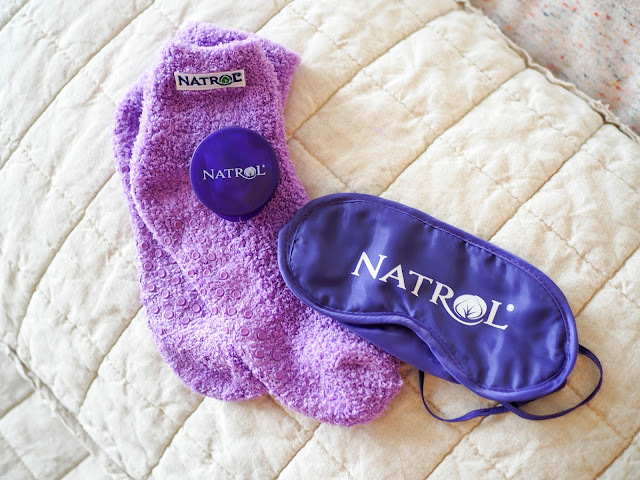 Natrol Melatonin promotes healthy sleep patterns, helps you fall asleep faster and helps you stay asleep. That all means waking up feeling more refreshed and ready to tackle those early school mornings. Natrol Melatonin is available in two forms. Natrol Melatonin Fast Dissolve is a convenient dissolving tablet that can be taken without water. It is available in both 5mg and 10mg doses. Natrol Melatonin Advanced Sleep is a 2-layer controlled release tablet offering maximum strength. It provides an initial 5mg dosage to help you fall asleep, and releases the remaining 5mg over time to help you stay asleep. Both are drug-free and non-habit forming. I'm looking forward to putting as many of these tips as possible into action and getting some good sleep. This last week of Summer is the perfect time for me to start on my new routine so that I'm rested and feeling great before the school year starts. How about you? What do you do to ensure that you get the sleep that you need? Do you have any other tips that you'd add? Do you take a drug-free sleep aid? 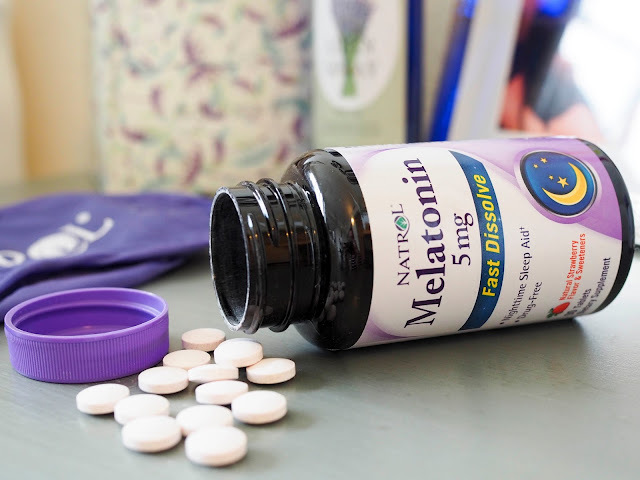 If you'd like to try Natrol Melatonin for yourself click here to download a coupon to save $2.00 off one product. Natrol Melatonin is available at mass-market retailers, online retailers, and in natural food and supplement stores. Just look for the purple bottle! Great tips. Glad to find your bog. Thanks for sharing. for a parents who has children at school you have to strictly control the amount of time spent near computer and amount of physical exercises. Children should be exhausted till night.